As someone who has been dealing with mental health issues for over a decade, this is a topic that's very close to my heart. I haven't actually read a huge amount of books where the topic of mental health is dealt with particularly well so it was actually quite easy for me to pick out those books which do. I have chosen these particular books for a variety of reasons, from realistic depictions of mental health to positive ruminations on getting better. If you are dealing with mental health issues then some of these books might be of interest to you and even if you're not then I still highly recommend all of them! 01. The Rest of us Just Live Here by Patrick Ness. The best thing about the representation of mental health in this book is that it isn't the main 'issue', some of the characters just happen to be dealing with mental health issues alongside the main storyline. I love this because it's just so representative of real life; although mental illness can often be overwhelming and the main theme of someone's life, it just as often isn't. Mental health is just one portion of life that we as humans often have to deal with, alongside everything else that's going on. Patrick Ness shows us that whilst dealing with mental health issues is extremely difficult, it isn't EVERYTHING, it is just one part of our lives, it isn't the whole of our lives. I just love this. Please read this book. 02. It's Kind of a Funny Story Ned Vizzini. I haven't actually read this for a few years so I am a little fuzzy on it. However I do remember that it was one of the first books I read where a main character was openly dealing with mental illness, and that felt very important to me. The book is realistic and heartbreaking but also funny and surprising. Ned Vizzini was inspired to write It's Kind of a Funny Story after his own brief hospitalisation for depression and unfortunately he ended his life in 2013. For me, even though this makes the novel more difficult to read, knowing that Ned was struggling so greatly, it just shows that mental health is something that needs to be addressed, it needs to be talked about and represented in the books that we read so that awareness is spread and people get the help they need. 03. The Perks of Being a Wallflower by Stephen Chbosky. As with many people, this book resonated with me hugely. The main character, Charlie, suffers from depression and anxiety, and the thoughts that he expresses on every page were thoughts that had been going through my head for years. I read it at a time when, looking back, I had clearly been sturggling with mental illness for years but I was undiagnosed at that point. I didn't think that my issues were serious enough to be considered an illness but I was desperately looking for representations of how I felt so I could try and define it and work through it some how. I was shocked at how accurately Chbosky replicated the thoughts and feelings of mental illness and I was completely captivated. I also thought that the film was pretty excellent, Chbosky wrote the screenplay so it definitely lived up to my expectations. I just felt like this was me being represented, it was everything that I had been thinking and feeling and I remember sitting in the cinema and sobbing at a particular scene because it hit such a raw nerve with the things that I was going through. It's definitely one for people who are struggling to figure out what they're feeling and why they're feeling it. This is getting rambly so I'm going to stop but you should probably read this book if you haven't already. 04. The Yellow Wallpaper by Charlotte Perkins-Gilman. I chose this as it is one of the earliest representations of mental health that I have read. First published in 1892, this story of a woman's declining mental health has become a classic due to it's status as an important early feminist text and it's representation of 19th century attitudes to women's physical and mental health. It is captivating and disturbing and speaks volumes about the stigma attached to mental health, particularly in terms of women. It's an extremely short story and I really recommend it to anyone. 05. Reasons to Stay Alive by Matt Haig. The thing about depression is that it's just so hard to explain to someone who hasn't experienced it. Matt Haig manages to accurately describe depression and anxiety and how he personally manages these illnesses without ever sounding maudlin, trite or preachy. I now feel I can just press this book upon people and say 'here, read this, this is me, you will know me now'. Matt Haig's writing is frank and beautiful and he manages to put into words thoughts that have been following me around for years. It is definitely one of the best books I've read this year and one of the best books on mental health that I've ever read. It's one of those books that I want every single human to read. 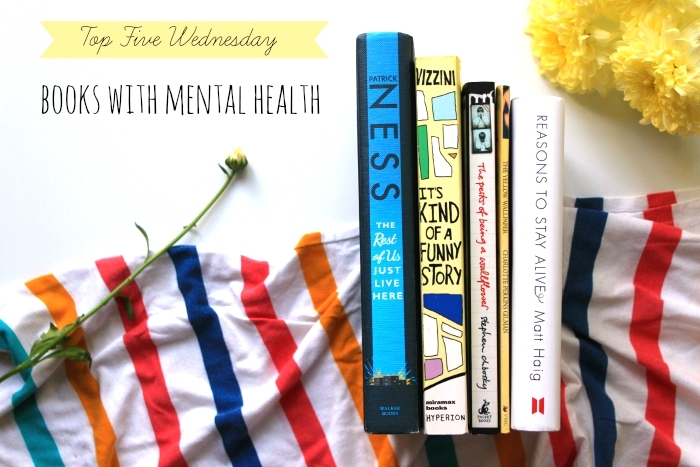 So those are my top five books with mental health. I recommend that as soon as you're done reading this you go and read one of these books, because they're all brilliant. If you've done a Top Five Wednesday post, please link it in the comments below!